The Celestron 44132 with 10x and 20x eyepieces and 4 included objective lenses (4x, 10x, 40x and 100x), you’ll achieve magnification ranging from 40x to 2000x. Improve the quality of your magnified images with the included 3 colored filters. 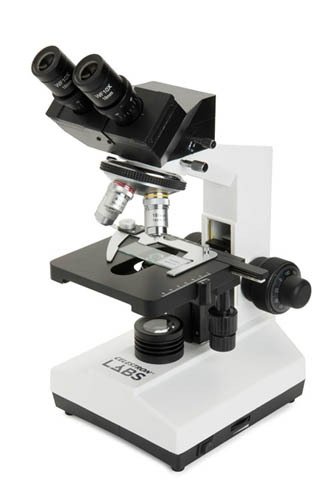 This microscope provides perfect illumination thanks its NA 1.25 Abbe condenser and iris diaphragm, which allow to you to control and concentrate light on your specimens. You can easily control brightness, contrast, depth of field, and evenness of illumination by adjusting the distance between the Abbe condenser and objective or by adjusting the condenser’s iris diaphragm. The fully mechanical stage has knobs to control both axes for easy centering of your slides. An all-metal construction means you can rely on the CB2000C for years to come. The Celestron 44132 has many exciting features for users of all types. You can extend the lifetime of your Celestron 44132 with the purchase of a FactoryOutletStore Factory Protection Plan. See the Celestron 44132 gallery images above for more product views. The Celestron 44132 is sold as a Brand New Unopened Item.